The 2013 Australian Open, a world famous tennis tournament, took place from January 14 to 27 in Melbourne, Australia. Novak Djokovic (from Serbia) beat Andy Murray (from UK) to win the men’s singles title. The women’s singles winner was Victoria Azarenka (from Belarus). She beat Li Na (from China). Both Azarenka (23-year old) and Djokovic (25-year old) won the Australian Open last year as well. They both are also ranked as the women’s and men’s World Number 1 tennis players. Bob and Mike Bryan (both from the USA) won the men’s doubles. Bob and Mike are twin brothers. Sara Errani and Roberta Vinci (both from Italy) won the women’s doubles. 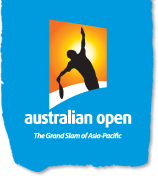 The Australian Open is held every January and is one of the four Grand Slam tennis tournaments (the other three are the French Open, the US Open, and Wimbledon). What do you serve but not eat? A Tennis Ball. Did you know? Novak Djokovic got the nickname “Djoker” because he cracks a lot of jokes. He is known for doing funny impressions of some famous tennis players.